Last weekend we visited a small, no frills local apple and pear orchard not far from our house. Over the last few days, the smell of applesauce bubbling on the stovetop and apple butter cooking in the crock pot have permeated the house. I can not believe how much we consume in the first couple of days – about half of the jars never make it to the cupboard or freezer! Since the apple butter is my favorite, I think I’ve consumed a loaf of bread, too. Chop up 8 to 9 cups of apples and put into crock pot. Stir in about 3/4 cup sugar for every 4 cups of apples. (Add a little more if you like your apple butter super sweet, a little less if you like it not so sweet). Add 1-1/2 teaspoons cinnamon. You can always add more cinnamon towards the end of cooking time, if you want a bit more for your taste. You can also add nutmeg, cloves, or whatever spices you like in your apple butter. Cook on low 7 hours, covered. If you are up and around, you can stir it occasionally; if you’re sleeping, don’t worry about it. Take off lid and stir; cook on high, uncovered, for 1 more hour, stirring occasionally. Depending on the desired consistency, you can mash the cooked apple butter with a potato masher, use an electric mixer, or run it through a sieve to make it perfectly smooth. We like a little bit of chunkiness, so I just use a potato masher. 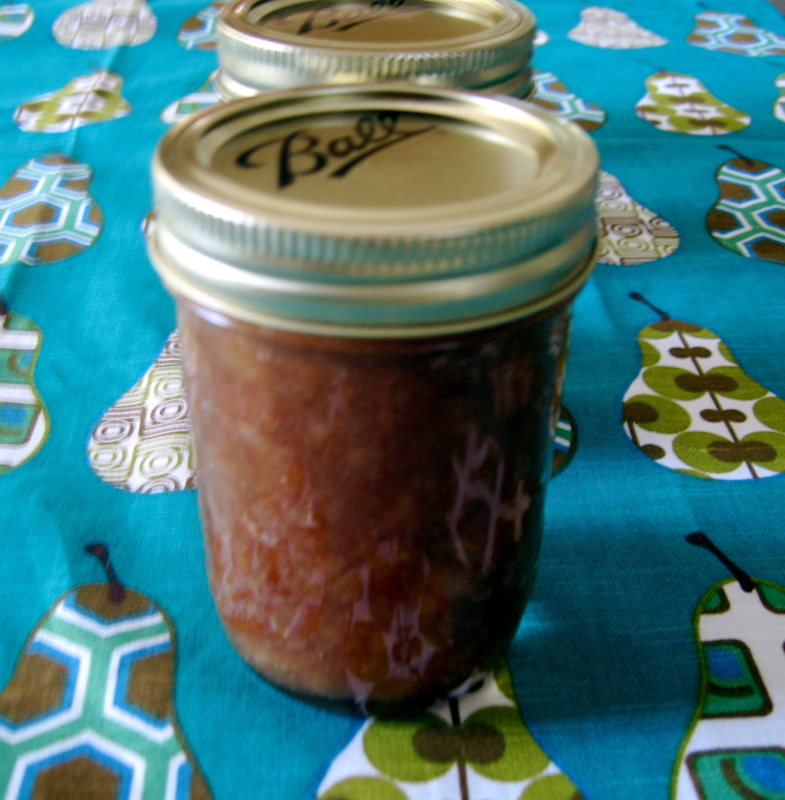 Can the apple butter using your preferred method, or simply put into clean jars and freeze. Opened jars will keep in the refrigerator for up to 3 weeks. Happy cooking and eating! As for me, I am going to eat a couple of apples so that I can have pie later on. 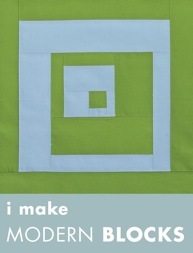 One of my favorite blogs is Purl Soho’s Purl Bee. 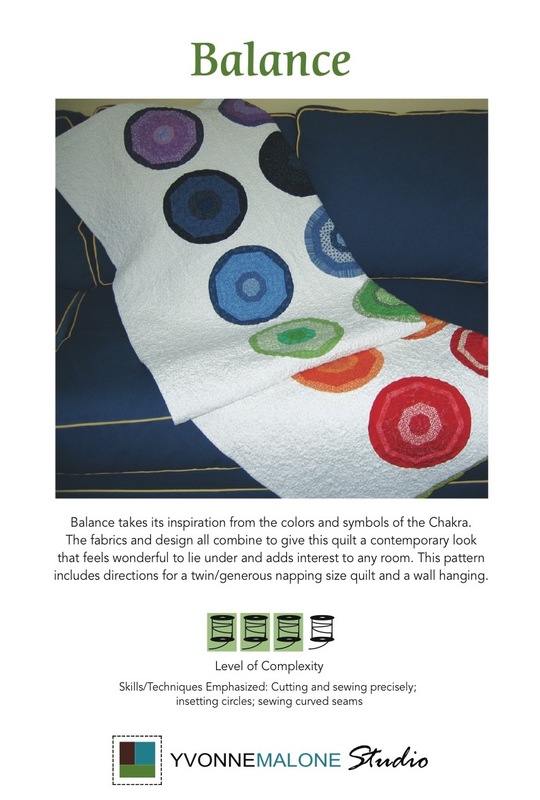 When I wake up Monday morning, I usually have an e-mail sitting in my in-box with a link to all of the beautiful new fabrics and yarns they’ve just unpacked at the store, as well as a link to instructions on how to make something using those new fabrics and yarns. 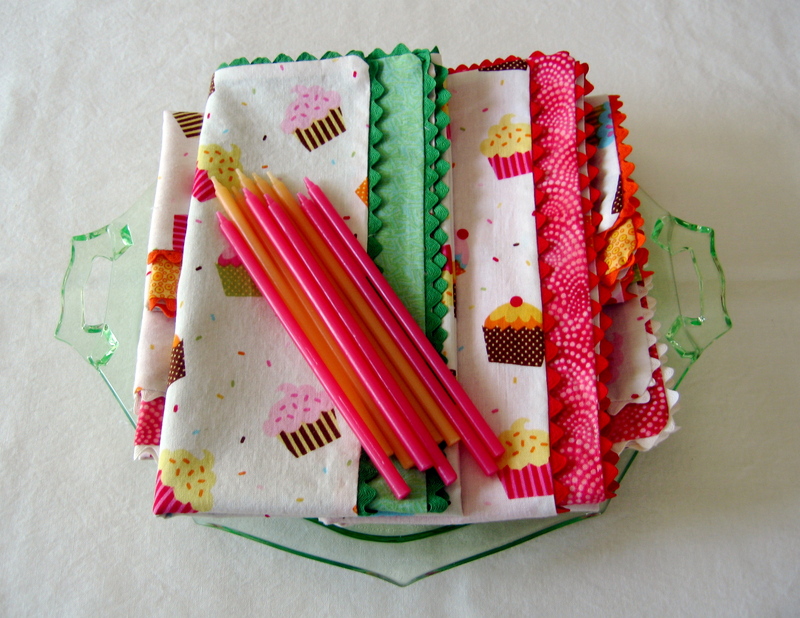 “Molly’s Spring Napkins” caught my eye several months ago, and now with birthday season kicking into high gear at our house, I decided to make some celebratory napkins! 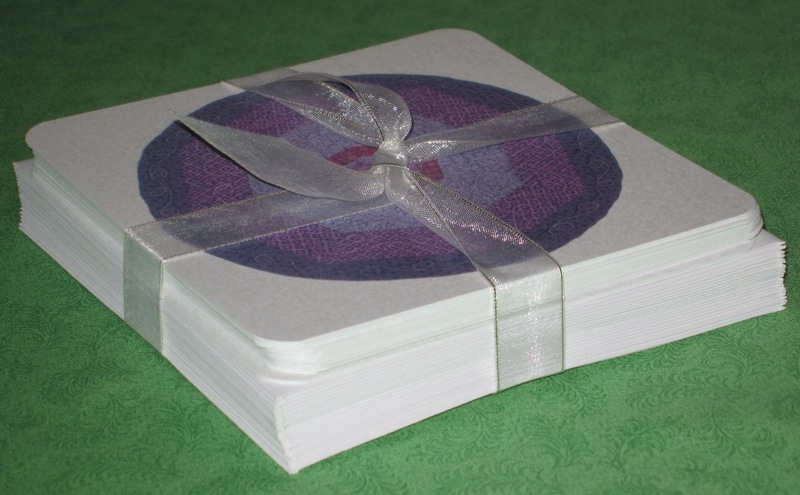 Another idea: Pair the napkins with festive dessert plates (new or vintage) – and maybe even a cake – for a birthday present or wedding shower gift. 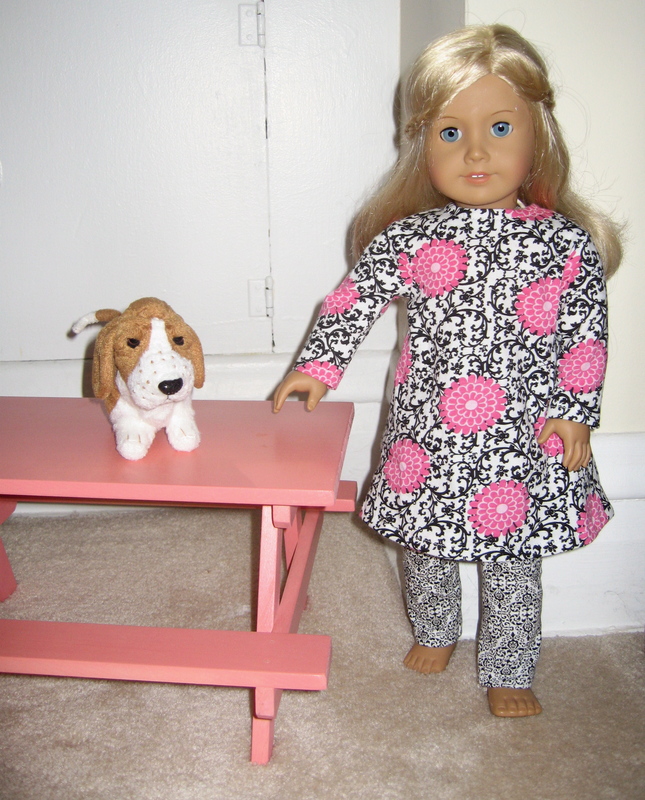 The pattern and fabric for Kelly’s (the American Girl doll in the photo above) hip outfit have been migrating around my sewing room for months now. Weighing the price of doll clothes sold in stores against my dread of sewing smallish tops and pants, I finally just decided to face my fear and make the darn outfit. 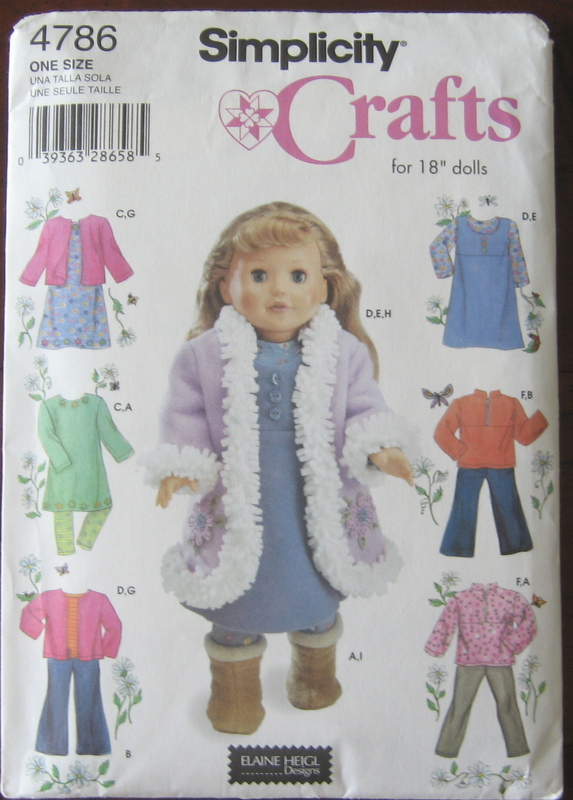 The pattern, Simplicity 4786, has several different styles; I chose the easiest (View C for the dress/top and View A for the leggings) because I don’t want to be challenged by clothes I am making for an American Girl doll named Kelly. I replaced the Velcro closure on the back of the dress with snaps and buttons because my sewing machine hates stitching through Velcro, and skipped the appliques around the neckline because the fabric we chose did not need any more embellishment. The whole outfit went together in about 1-1/2 hours – and I did not even need to rip anything out or have a glass of wine at the end! In fact, it was rather gratifying to make an entire outfit and not be disappointed by the fit or fabric. Best of all, Kelly loves the outfit and has been wearing it for several days straight! 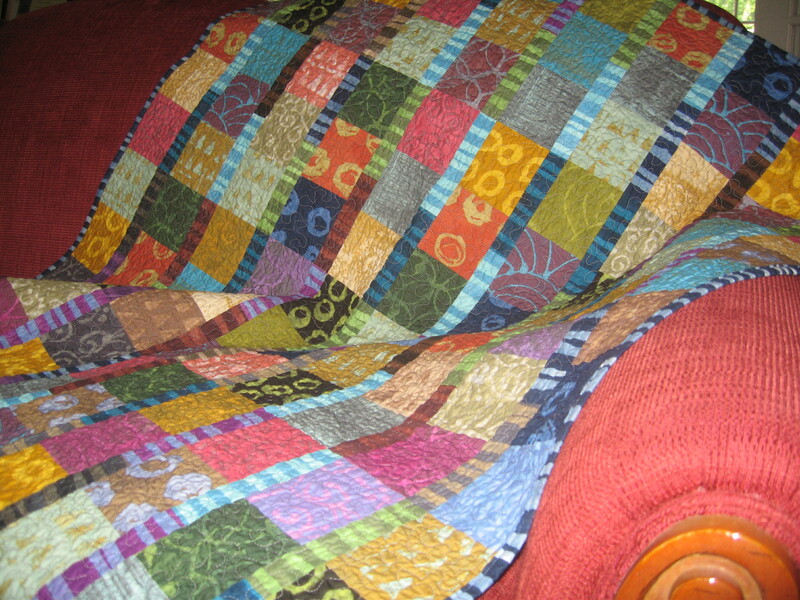 As for me, I think I will whip up several more of these for upcoming birthday gifts.